This large catalpa trees grows in a yard a few lots away. These lovely flowers will turn into large bean-shaped pods of seeds later in the season. 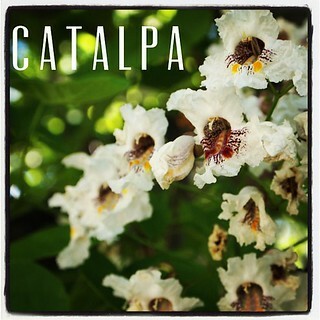 “Catalpa, commonly called catalpa or catawba, is a genus of flowering plants in the family Bignoniaceae, native to warm temperate regions of North America, the Caribbean, and East Asia. Mostly deciduous trees, they typically grow to 12–18 metres (39–59 ft) tall and 6–12 metres (20–39 ft) wide. A 10-year-old sapling will stand about 6 metres (20 ft) tall. They can be recognized by their large, heart-shaped to three-lobed leaves, showy white or yellow flowers in broad panicles, and in the autumn by their 20–50 centimetres (7.9–20 in) long fruits, which resemble a slender bean pod, containing numerous small flat seeds, each seed having two thin wings to aid in wind dispersal. Because of the leaves, they are sometimes confused with the tung tree (Vernicia fordii) in the southern U.S., or the invasive Paulownia tomentosa imported from China. Categorized under: Flowers, Garden Alphabet, Photos, Trees.